An exceptional record produced by a band who are stretching the limits of what a band, pop or otherwise, can achieve. A Brief Inquiry is probably the most excessive major league album since Daft Punk’s Random Access Memories. What the 1975s are doing is a fair leap forward in what could be the best record of their career. The 1975’s most adventurous album. There’s much to admire about A Brief Inquiry into Online Relationships. It’s slick and modern pop zeitgeist-y, with wipe clean surfaces, and all not terribly memorable. It may feel more like a Healy solo album, but The 1975 manage to cover new ground, and hold your attention for a full 58 minutes. It will serve as a time capsule of a troubled and technological era, but will never be a relic – this is an album that will be looked to as a touchstone for artistic talent. It is absolutely their weakest project to date and one that I'd even struggle to see the less diehard fans embracing. In bittersweet danceable catchy tunes, The Humanity, lost in 1975, packs it so that you could almost lose yourself in it. This album would be nice if the truth were not so sad. You notice that The 1975 is going somewhere with "A Brief Inquiry Into Online Relationships", but does not really understand where to go. The best of the '80s,' 90s and '0s - it rarely sounded as appealing as here. There are those who will celebrate the artistic ambition and wonder at the genius of such a diverse and challenging record and there are those who will simply wonder whether or not the band has completely jumped the shark. If you haven’t yet listened to A Brief Inquiry Into Online Relationships, though, you’re missing out on a beautifully produced album. Their anthological third album ushers in a daring direction for their musical modus operandi, offering their usual, sonic eclecticism with a recipe of added edginess, zeitgeist-y lyricism, millennial nostalgia, a dash of pop formula and a pinch of unnerving Siri monologue. Though A Brief Inquiry is just as dizzying and disorienting as 2016’s heroically omnivorous i love it when you sleep, for you are so beautiful yet so unaware of it, the 1975 take themselves a little more seriously now. A Brief Inquiry into Online Relationships plays like an album made by kids who experienced the potential of the internet as it was being realized. Covering the topic of relationships in this new age of technology and our modern age, the album transcends our time. A bold and endearing collection of tracks that offers a bigger arena ready sound that compliments their massive upcoming world tour. While there are a couple glitches it’s still a hauntingly beautiful honest and raw album. A sprawling, thoughtful LP that grapples with the big issues of our time in cheeky and mournful ways, it’s a poison-pen love letter to the interiority forced upon its audience by social media, piercing through the flatly punctuation-mark-free affect that dominates online chatter with brute-force musical curiosity and a well-placed gospel choir or two. It’s a picture-perfect depiction, a mammoth snapshot of what it’s like to be young and living in 2018. If you hated The 1975, this album will teach you to love them, or at least like them. A Letter Inquiry Into Online Relationships is really good. Brilliant even, since this is a commercial pop album that will fill many concert halls with hysterical teenage girls. We appreciate that they want to take a different approach and want to stand out in this full music world, but the whole must be more than the sum of the parts. Not a perfect final big release of 2018, but still well worth a listen. A Brief Inquiry Into Online Relationships is a considered, ambitious album from a band who are constantly pushing themselves. 'A brief inquiry into online relationships' contains susceptible concepts, good songs, is eclectic, but above all sincere. The result is the genre-defying, grandiose statement Healy promised it would be. For a band that started out deeply entrenched in a singular style that had the benefit of evoking nostalgia for accessibility, it is commendable to see The 1975 travel forward and try out more new things with each record. An often thrilling, but occasionally tiresome listen. The 1975 still shows they’re more than able to make great pop music in big and small ways. Oversharing or not, The 1975 tunes into its internal dialogue and looks outward all at once, filling in the seemingly isolating moments of these volatile times. Looking past all the hyperbole and over-excitement, this is a good album, though bogged down with a lack of consideration to make it a great one. Overall, it’s not as gleeful as their last one, but melodic light relief abounds, as on the Belinda Carlisle outtake that is It’s Not Living (If It’s Not With You). It's far-reaching in scope but it's also conceptually uniform, a beautiful mess of an album from a band who is inching their way towards the imperial phase of their career. The 1975 are without doubt the band of the moment. It may not have the full-on bangers of their last two full-lengths, but 'A Brief Inquiry Into Online Relationships' still sits as a bold and vibrant collection of pop-based singles. A Brief Inquiry Into Online Relationships is an album that reflects on the modern day issues of technology, drugs, politics and relationships with a beating millennial heart that is honest and hopeful for the future. With 'A Brief Inquiry Into Online Relationships', The 1975 have proved their mettle as the flagbearers of experimental pop yet again. With such flawless execution, The 1975 have captured the zeitgeist of this particular era of popular music, as A Brief Inquiry Into Online Relationships will be seen as this decade’s defining record, cementing The 1975 as the most important band of our time. It’s a batch of quality pop songs – nothing more, nothing less. A Brief Inquiry Into Online Relationships feels urgent and present in all of the places The 1975's previous projects felt reminiscent. A Brief Inquiry is not without its flaws but it’s never boring. A Brief Inquiry’s overall feel is measured and introspective. "A Brief Inquiry Into Online Relationships" is THE album of the decade. Taken as a whole, the album is often as disparate and difficult to wade through as the social-media landscape it hopes to comment on. Its music goes from characteristically bright 1980s pop-rock to jazzy R&B and Radiohead-style modern rock, an eclectic soundscape that fits together coherently. It makes no sense as a coherent record, and the first half is considerably stronger, but the 1975 are just living in 2018. In the end, you think: The 1975 is always best if you do not make it so complicated. The Manchester band's latest creation, the lofty A Brief Inquiry into Online Relationships, [is] all the more striking. Some tracks are more immediate, others will take a few listens to really enjoy to their fullest, but there's lots for fans to enjoy here and the boys deserve credit for being bold enough to push into new territory in a way that shouldn't alienate those who fell in love with their first two albums. A tone of urgent honesty pulses through the album, a visceral need to connect that shatters the production's glittering surfaces, breaking through with emotional weight on the warped synth ballad Inside Your Mind and the dreamily epic final track, I Always Wanna Die (Sometimes). The first band to capture the millennial experience on a dense album that, after repeated listens, reveals itself to have a kind of clouded brilliance. Healy’s heart-on-sleeve approach to songwriting makes this album an immediately relatable listen, and is proof that The 1975 are a band we should all be taking seriously. The 1975 manages to make all its ambitious pieces fit together. A Brief Inquiry Into Online Relationships is a record that doesn’t hold back. It covers a massive range of themes and ideas, politics and religions, drug habits and the internet—and while it’s a lot to take in, The 1975 somehow make it work. The first of two albums recorded in tandem (“Notes on a Conditional Form” arrives next year), “Brief Inquiry” contains enough lyrical concepts and genre experiments to fill at least four; it’s the band’s most fearless disc, equally informed by Healy’s decision to kick heroin last fall and his newfound determination to blow the 1975’s very soul out across the interwebs. Yet more than ever before the 1975 prove themselves masters of the form. Brief Inquiry is charmingly flawed, as memorable albums often are, but the strengths outweigh the weaknesses. 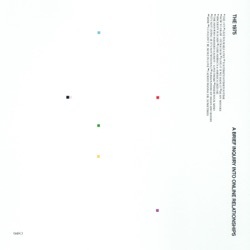 Undoubtedly the finest rock album of the year made by a bunch of guys who sound positively sick of rock music (and there’s been a few of those this year), A Brief Inquiry Into Online Relationships is The 1975 at their most broadly appealing and their most daring. Brief Inquiry is a vivid and panoramic record about what it means to be alive right now, in all its terror and glory. It veers wildly among mechanized garage rock, ’80s-era soft pop, atmospheric dance music and lush acoustic balladry; one song strongly recalls Justin Bieber’s “Sorry,” while another looks back to the Great American Songbook. All songs on the album are nice on first listen and I’m sure anyone with ears could appreciate the precision and thought that has gone in to each song. Saying this though, I don’t think any song has the timeless beauty The 1975 have been striving to achieve since their debut album five years ago. A Brief Inquiry Into Online Relationships isn’t perfect. It isn’t the best album released this year, and it doesn’t have any of the best songs released this year on it. But what it does have is scope, vision and scale, together with power, texture and atmosphere. It has a daft title, and a few daft songs with hammy lyrics. It has variety, diversity and its heart on its sleeve. It has pretence, artifice and ambition. It has, basically, everything. It’s a treatise on what social media and internet omnipresence mean to a generation of young people who can still remember what it was like not to have it, even if they were only kids at the time. A Brief Inquiry is not the unqualified triumph the 1975 had in mind. It’s stronger and punchier than its predecessor, but has moments where the group overreach. An album whose main aim is to be sincere and without a doubt, it succeeds. [It] sounds entertaining, varied and in places phenomenal! The English band the 1975, practitioners of some of the smoothest electropop in recent memory, have delivered another gem with “A Brief Inquiry into Online Relationships,” the group’s third full-length album that serves as a heart-wrenching roadmap for modern relationships teeming with tumult. The 1975 have aimed for the stars on A Brief Inquiry.. and while it’s not without flaws, their ambition is mostly achieved. On their third and best album, A Brief Inquiry into Online Relationships, The 1975 have created what so many post-Radiohead bands couldn’t: a coherent pop statement with enough hope, radical honesty and genre-spanning breadth to make sense across divided generations. A pop album that suggests some growth and depth. For all its glimpses of brilliance, ABIIOR is also a wild ride through the mind of Matt Healy, a genre defying rock star for his generation of millennials. In both their glib observations or their resonant couplets, the 1975 here come across like poet laureates for a lost and scrambled generation. A Brief Inquiry into Online Relationships is unwieldy, provocative, absorbing and uncontainable. By interrogating the strategies we employ to keep on living in an impossible world, this astonishing album has become one. The 1975 don’t presume to have all the answers, but their sincerity and vulnerability make for a tremendous record that speaks to the state we live in. It’s their best work yet. A Brief Inquiry Into Online Relationships is something else entirely: a meditation on how easy it is loses your sense of yourself in a world of ceaseless distractions and where our heightened, online identities increasingly bleed into our true selves. A Brief Inquiry Into Online Relationships is a pained reflection of troubling and lonely times but through expressing their own isolation, they may have switched on a light for many others. The flashes of light that the disc possesses remind us of why we cling to life: hope. Largely speaking, it’s fair to say that 'A Brief Enquiry Into Online Relationships' has been a success ... Nonetheless, it’s hard to ignore its shortcomings, and it is all too easy to rue what might have been, as there are moments of brilliance here that are too often cut short by an unnecessary lull in artistic reinvention. A Brief Inquiry is a record of substance that manages to both poke fun at and be a product of its time. An album that’s comprehensive in its voice, brutally honest, and musically broad. Clever and profound, funny and light, serious and heartbreaking, painfully modern and classic-sounding all at the same time, ‘A Brief Inquiry Into Online Relationships’ is a game-changing album, one that challenges The 1975’s peers – if, indeed, there are any – to raise their game. 😊😊😊 A poetic look into the internet and how it can corrupt but also found beautiful relationships though it! The 1975 always does well in telling a story no one else has thought of! They can create the perfect dreamland. Stan I’ve been a fan of the 1975 since 2008 and they are always changing and making music for every genre. That’s what makes them so lovable by everyone. There is a song for everybody. These singles give me 100% faith in them to release even greater songs this November. How can you not like this? I’m an old fart that was in high school in 1975 lol I love the 1975! Agree with all the comments about how they are continuously changing their sound ! Amazing!